16C/61F - nice that the weather is warmer. Good run - wanted to run 3:50 ks. Followed or tried to catch people the whole way. Last 300 alone, but had a good kick. Felt good but had to push the entire way. Quite a bit faster than the 7k race last Friday. Legs stiff - DOMS from Wednesday? 2:30 - 15.6k with 10k at quick tempo pace. Felt good, but not great. Held the pace well. Wore my 10K/half racing shoes, a bit lighter than usual. This is to help prepare me for a 10 mile race on April 20th. 21C/70F - nice day, warm, but not too warm. 4:00 - 12k in 1:09:53 @5:50. Easy run - recovery from yesterday. Well done....you are running well. How does your weight go UP during a 5 Km time trial !! Excellent time trial time. 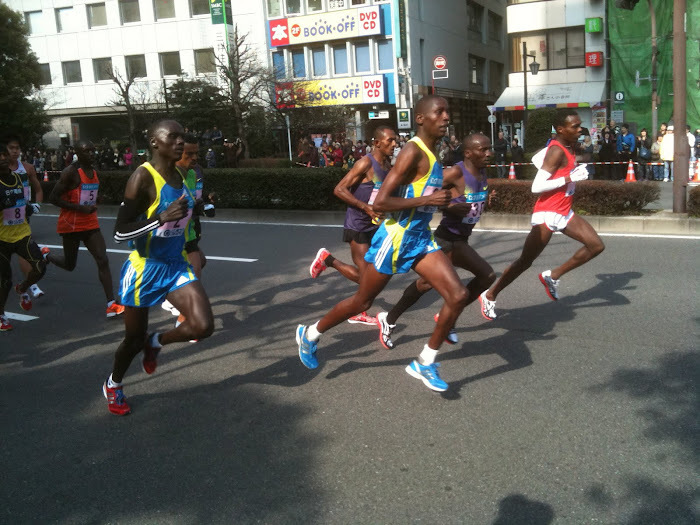 I had no such luck at the Incheon half-marathon where Kawauchi ran. Don't know what happened but the race didn't reflect my fitness level. I choose to DNF as I didn't want to do a "death shuffle" the last half. And it was rather warm. I had very good training up to it. And even planned to just run it as a workout, but that wasn't to be. Another day, another run, always another race. Jon - the weight under each day's workout is my weight in the morning, before breakfast. 3.50, 3.50, 3.50 for the first 3K with a goal of 3.50 - I'd call that nearly a full house and a very good run. Good 5000 & last k Bob. Nice 10k tempo run too. You're running well.